Every year, beauty brands either come up with new or reformulated whitening products so that they can promote them in March otherwise known as the whitening month. 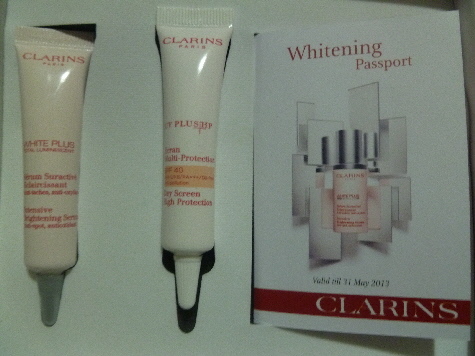 So it came as no surprise when I received a postcard from Clarins asking me to collect samples from their whitening range. Clarins is one of those few beauty brands who, when they offer samples to their customers or members, don’t stinge by giving mere sachets. This is one brand which gives generous size samples which can often stretch me to a week or more. How often have I taken the trouble to complete a form at a beauty counter only to be handed a miserable sachet which is good for just one use. Sometimes I think the effort is hardly worth it! What’s new about certain products in their whitening range – serum, cleanser, toner and sunscreen – is the Trans-Luminescent Complex® based on the best of plant extracts. Some of the key ingredients are hyaluronic acid, sandspurry extract and ginkgo biloba extract. 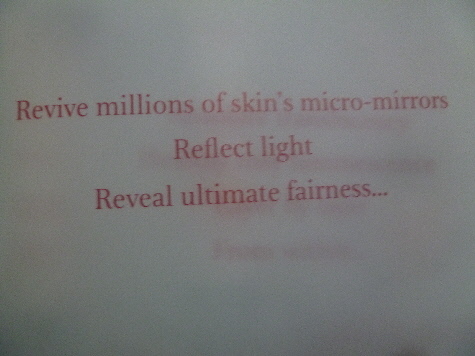 Among 53 women who’ve used the products over 4 weeks, the majority found they had more transparent skin, a more even, unified complexion, clearer complexion, less yellowish skin tone and improved rosy luminescence. In the box are 2 x 10ml tubes of the reformulated Intensive Brightening Serum and Day Screen High Protection SPF 40. These tubes are 1/3 the size of the full size products which means they are worth RM150. Not bad for samples. The first thing I noticed when I squeezed out the serum is that it’s now in clear gel form when previously it was a white opaque cream or is that opaque white cream? 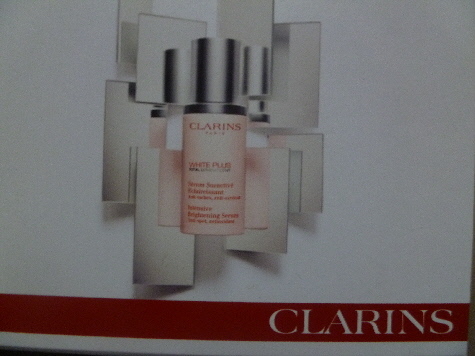 The serum feels so lightweight and more moisturising than the previous version which I have used before when it was known as Clarins White Plus. The Day Screen is a very pale pink and has such a pleasant scent. I have always liked their Day Screen High Protection and think it’s one of the best among the counter brands as it doesn’t feel sticky and absorbs into skin immediately. Of course, reformulated products is both a good and not-so-good thing for consumers. Good because the formulation keeps improving with hopefully better and faster results. 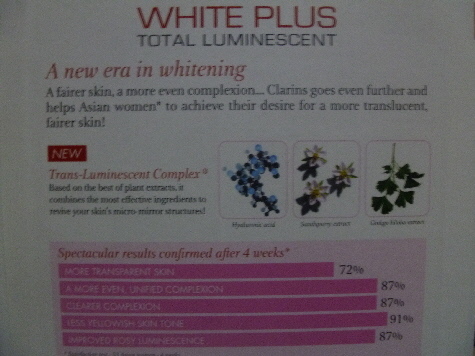 On the downside, prices more often than not increase with each new formulation and in this case, it does because the previous White Plus Serum was RM260/30ml whereas the White Plus Total Luminescent Serum is now RM295/30ml. 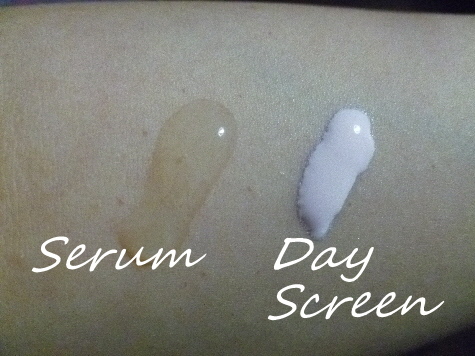 The Day Screen retails at RM158/30ml. Also in the box is a whitening passport. 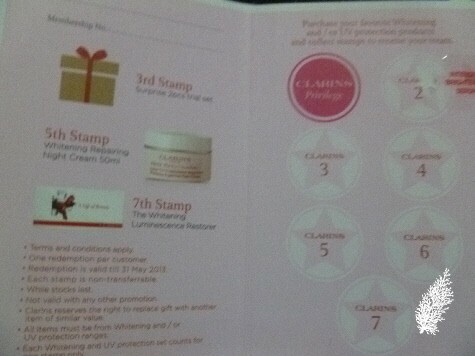 Purchase products from their whitening range or UV protection and you receive one stamp for each product purchased. 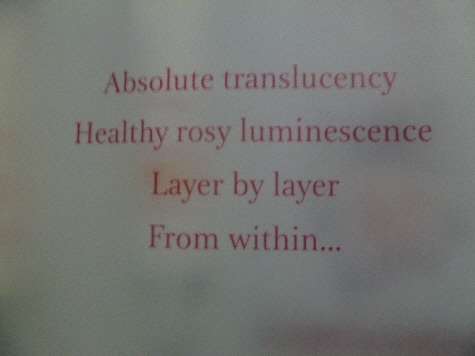 One of the products purchased must be the new serum. The 1st stamp has already been given so you just need to get another 2 stamps to be eligible for the 1st reward which is a 2 piece trial set. On obtaining the 5th stamp, you will receive a full size 50ml Whitening Repairing Night Cream and on the 7th stamp, you will be entitled to a complimentary session of the Whitening Luminescence Restorer Facial. By the way, this sample box is much more satisfying than some of the beauty boxes I have received. Seriously, these are the kind of samples they should be giving. Which is why I say beauty box subscription companies can do better. If we pay, we should get more than what we pay for, not equal or less.